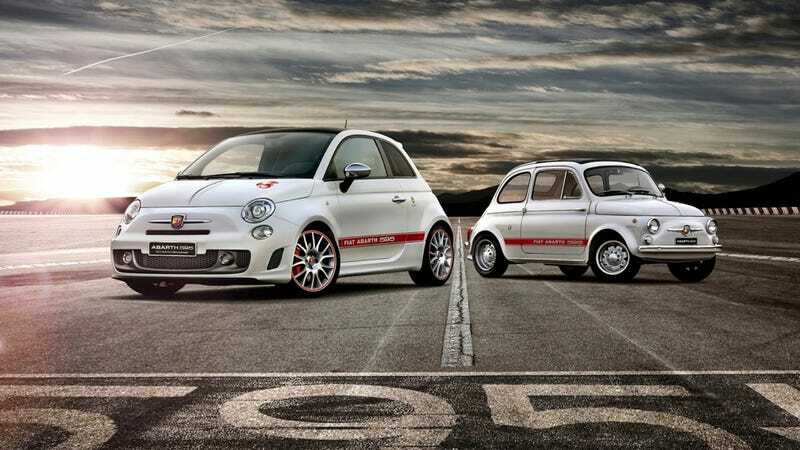 I love the Fiat 500 Abarth. Other than the awful driving position, it's one of my favorite cars. But now those lucky Europeans are getting a 20 horsepower bump for a limited run to celebrate its 50th anniversary. Dio mio! The latest in the line of angry little Italians is this, the 500 Abarth 595, comes 50 years after the first Fiat 595 debuted in Turin. What's similar is the sticker package. What isn't similar is under the body. For the 595, Fiat has bumped the power. No, it doesn't have 595 horsepower, but instead gets a more modest bump to 180, up 20. And here's something that'll make everyone get their undergarments in a bunch, the Abarth 595 doesn't have a manual transmission. It does have paddle shifters. I'm fine with this, but I'm sure at least 12 of you (perhaps more) have had their heads explode in a fit of fury. Sorry. Fiat will only make 299 of the 595 for European customers. So don't worry, most of you complaining about a lack of a manual won't even have a chance to buy one. And there's always the regular Abarth, which is still wonderful. So yeah, it's all gonna be ok.